Nature provides many examples of physical systems that are described by deterministic equations of motion, but that nevertheless exhibit nonpredictable behavior. The detailed description of turbulent motions remains perhaps the outstanding unsolved problem of classical physics. In recent years, however, a new theory has been formulated that succeeds in making quantitative predictions describing certain transitions to turbulence. Its significance lies in its possible application to large classes (often very dissimilar) of nonlinear systems. 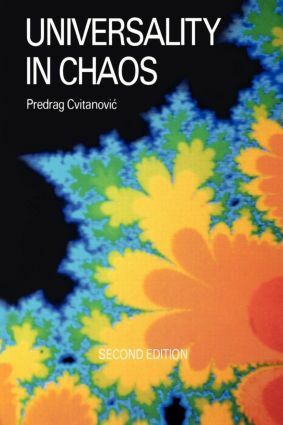 Since the publication of Universality in Chaos in 1984, progress has continued to be made in our understanding of nonlinear dynamical systems and chaos. This second edition extends the collection of articles to cover recent developments in the field, including the use of statistical mechanics techniques in the study of strange sets arising in dynamics. It concentrates on the universal aspects of chaotic motions, the qualitative and quantitative predictions that apply to large classes of physical systems. Much like the previous edition, this book will be an indispensable reference for researchers and graduate students interested in chaotic dynamics in the physical, biological, and mathematical sciences as well as engineering.